Chalkis is the capital and the main port of the Regional Unit of Euboea of the Region of Sterea Ellada (Continental Greece). It dominates the two banks of Evripos Straight, one part of the city being on the island of Euboea and the other on Sterea Ellada. On its continental side and on the hill of Kanithos, the Venetian Fort of Karababas overlooks the city, the old Bridge of Evripos Straight and the unique tidal phenomenon, where sea waters change direction every six hours and in between they stand still for about one hour. These are the most significant characteristics and sites of the city. According to the 2011 census Chalkida has a population of 59.125 people. St John the Russian (in Ukrainian: Йоан Руський‎, 1690, Ukraine – May 27, 1730) is a Saint of the Greek Orthodox church. A was prisoner at first, then the slave of a Turkish Agha, he became known for his kindness, humility and solid faith. His holly relic (Schinoma) is kept intact at Neo Prokopi, in Euboea and he is considered to be a miracle maker with many witnesses speaking of his help to heal the sick. Kymi is a town and a port in the Prefecture of Euboea as well as the headquarters of the Holly Metropolis of Karystia and Skyros, encompassing 2.383 inhabitants; the Municipal Unit of Kymi enjoys a permanent population of 2.870 inhabitants. It used to be the headquarters of the former Province of Karystia and till December 31, 2010 it was the headquarters of the Municipality. It is now the municipal unit of the new extended Municipality of Kymi-Aliveri, and it remains its historical headquarter. Karystos is a town by the sea as well as a port of South Euboea; it is also the headquartes of the Municipality of Karystos and, in the past, it used to be the capital city of the Province of Karystos. In 1951 it had 3.118 inhabitants and according to the census of 2011 the population increased to 5.112 inhabitants. Karystos is built at the inlet of the gulf of Karystos at a height of 10m. Its port is only 61 nautical miles away from Piraeus. There is a regulat ferry connection between the port of Karystos and Rafina. 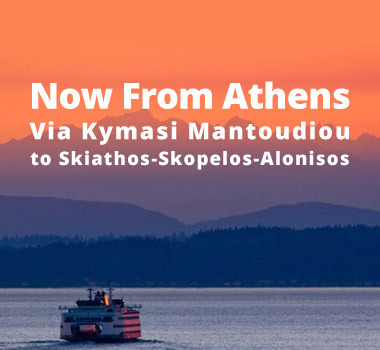 There used to be a ferry connection from Piraeus to Volos stopping at the port of Karystos in between. Furthermore, the city is connected by road to Athens through Chalkida. Skyros is the most southern island of North Sporades and the largest one (with a surface of 210 km2) with a population of 2.994 inhabitants. At the eastern side of Euboea and at a distance of 35 km from it. the majority of the island has a mountainous relief, mostly south-east, where the mountains of Kochylas (792 m), Koumari, Piriones and Fanoftis are. As for the climate, the summers on the island are cool and the winters are mild, with an average annual temperature of 17oC. To the West, there are the anchorages of Kalogria, Pefko, Ag. Nikolaos and Tristomo. The port of Linaria is at the west coast of the island. Limni is a town, in North Euboea, near the ancient city of Elymnion, found in the plays of Sophocles. It is the headquarters of the extended Municipality of Mantoudi-Limni-Agia Anna. According to the census of 2011, it boasts a population of 1.642 inhabitants and it is built at a 19-m altitude. Loutra Edispou are a town in the Prefecture of Euboea, Municipality of Istiea-Edipsos as established according to the Kallikratis Program. It is a distance of 107 km north-west of Chalkida. It has a population of 2.560 people according to the census of 2011. This settlement is the largest thermal resort in Greece [See ref. ], due to its thermal springs which are recommended for the cure of many diseases. Lichades or Lichadonisia are a cluster of 7 islands and many small islets north-east of Euboea, between the gulf of Maliakos and the North Euboean gulf. They are located between the settlement of Lichada, on the side of Euboea, and of Kamena Vourla on the side of Fthiotida. They are administrated by the Municipality of Istiea-Edipsos, as it was formed according to Kallikratis program. Saint David was born in Gardenitsa (former cadastral region of the community of Kyparissi), in the Prefecture of Fthiotida, most probably at the last quarter of the 15th century, and he lived until about the first half of the 16th century. He was the Hegumen of the Monastery of Panagia Varnakova from 1520 to 1532, and then he went to North Euboea, to Rovies, the present Municipality of Elymnion. He founded a Monastery there, which became very renowned and which, now, bears his name. He was one of the enlightened masters of the Nation, offering a great deal to the education of the enslaved Greeks, and became a Saint of the Orthodox Church with a number of miracles attributed to him.